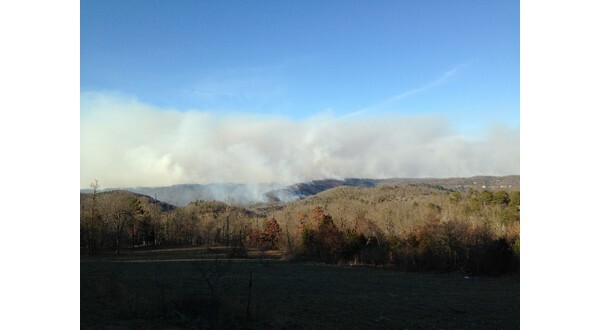 Photo: The view from Cozahome with smoke rising from the Lower Buffalo Wilderness prescribed burn. Courtesy R. Wiggs. The closure of the Lower Buffalo Wilderness area of the Buffalo National River in effect for the past month due to prescribed burns has been lifted. The entire area, located in southeast Marion County approximately 7 miles southeast of Flippin, is now open to horse and foot traffic. Visitors to the area should use caution, as tree stumps and dead trees may continue to smolder and have the potential to set nearby leaf litter or grass on fire for short periods of time. This behavior will persist until the area receives adequate rainfall. Over the last month, fire crews spent multiple days and made multiple entries into the unit igniting and monitoring the prescribed burn. The fire burned in a mosaic pattern, generally backing down from the ridgetops into the drainages and valleys, helping to promote the restoration and maintenance of the ecosystem using fire as a natural component. The low intensity fire reduced the accumulation of dead and down fuels, lowering the chances for a catastrophic wildfire in the future and provides wildfire protection for adjacent lands during times of drought or extreme fire danger.